Prithviraj is eyeing for another outstanding year with the movies he has in kitty for the year 2013. He started 2013 with big bang. His only two movies of the year –'Celluloid' and 'Mumbai Police' were super hit and got positive reviews from both critics and viewers. The Kerala state Best Actor 2012 already made his presence felt in Bollywood with two movies- one shouldering him positive acclamation. He has three more Malayalam movies announced this year. They are 'Memories', 'London Bridge' and 'Oru Cinema Kadha'. Upcoming Malayalam films of Prithviraj are detailed below. 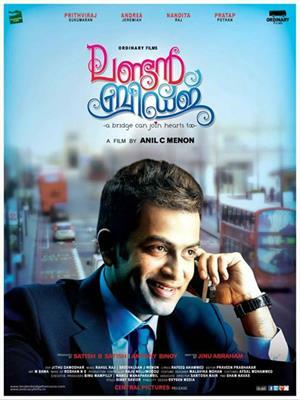 'London Bridge' is another Malayalam movie of Prithviraj currently in shooting. Directed by Anil C Menon, the movie has Mukesh and Andrea Jeremiah in other lead roles. Set complete in United Kingdom 'London Bridge' tells the story of a young and ambitious professional who is stuck between the two loves happened in his life. Telugu actress Nandita will appear as his second love interest in the movie. 'London Bridge' will be a moral lesson in it, that is love and relationships are not to be forgotten while running for successes in life. Moreover it also emphasize how love heals the feeling of loneliness on people who are away from their homeland. It is produced by Jinu Abraham. Jeethu Joseph's 'Memories' is the upcoming Malayalam movie release of Prithviraj. It is an action thriller dealing with the story of a Police officer named Sam Alex, played by Prithviraj. He is one of the most entrusted officer but suffers from many personal shocks. He stills lives in the pain created by those losses. He move on to alcohols to find some peace. It is at this moment that he is being appointed as in charge of a new case. He meets a news reporter and the events followed by this makes the movie an action thriller. The alcoholic, emotionally damaged Sam Alex will be another outstanding character from Prithviraj. Meghna Raj as Prithviraj's wife and Mia as the reporter are the two lead heroines in the movie. Other cast include Nedumudi Venu, Vijayaraghavan, Madhupal, Suresh Krishna, Sreejith Ravi, Rahul Madhav and Aneesh G Menon. 'Memories' is produced by Santha Murali and P.K Muralidharan under the banner of Anantha Vision. Prithviraj will be seen sharing screen with Vineeth Sreenivasan through this new film. 'Oru Cinema Kadha' is directed by 'Ordinary' director Sugeeth. This is an experimental film with three climaxes in it. The movie initially revolves around the love story of a guy. But he loses his girl. Later three film technicians- director, cameraman and writer try to make a film based on this story The three people come up with a climax of their own and that is the most interesting part of the movie. 'Arival Chuttika Nakshathram'- a film starring both Prithviraj and Mammootty in main role is one of the highly hyped movie announced long back. It is an Amal Neerad movie telling Kerala political story spanning from 1950-60. The movie is delayed for a while. Another movie 'Godse' a Shaji Kailas movie is also an earlier announced project of Prithviraj. Although the number of upcoming Malayalam films of Prithviraj is less compared to his 2012 filmography, the actor has few other language movies. Prithviraj has been doing well in other language films like Tamil and Hindi. The actor is on cloud nine with his new Bollywood project titled 'Happy New Year' with Shah Rukh Khan. The movie is directed by Farha Khan. A Tamil movie titled 'Kaaviya Thalaivan' is also awaiting for the star. The preproduction works of this Vasanthabalan movie is progressing.